Noughty Haircare is built on balance, that's the key in life, so why can't our hair be the same? Well it can. They make haircare for people who are serious about doing good but don't take themselves too seriously. They believe perfection is not only overrated, it's dull, they want everyone to lighten up and be their happiest, most real selves. Noughty love natural ingredients! They hate fake, no nasties like silicone, sulphates or parabens! This is range that I personally use and really enjoy for my wavy / curly hair, it smells amazing & it’s one that I recommend. When I was getting my curls back these products were one that helped me a lot These are effective products, that are cruelty free, 97% natural & vegan, how can you go wrong? Friendly for children and adults who do have wavy & curly hair. 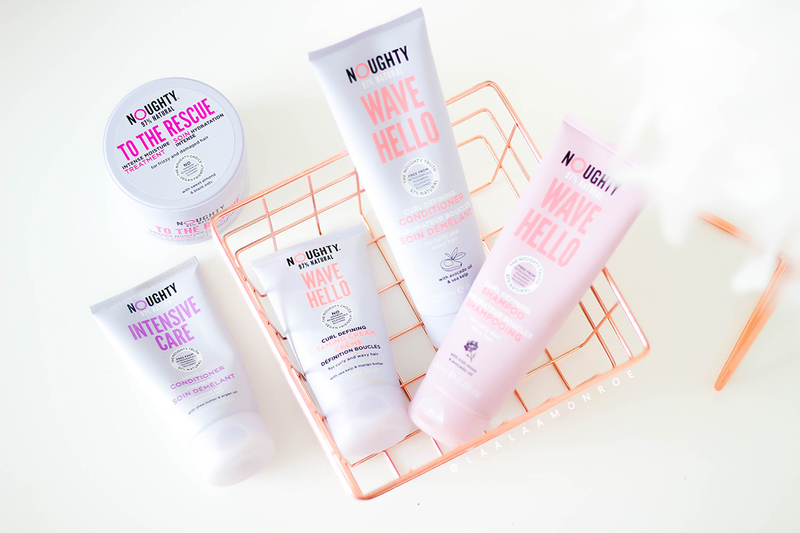 WIN THE NOUGHTY HAIRCARE WAVE HELLO RANGE!! WIN THE THREE ITEMS IN THE BASKET!!! • Sea Kelp – Rich in a variety of vitamins and minerals such as B complex vitamins, high in Vitamin K, iodine, magnesium, zinc and calcium. • Irish Moss – Another rich in vitamins and minerals Vitamin A, Vitamin B and Vitamin D, calcium, magnesium, and iodine, it soothes the scalp, conditions the hair, enhances shine and protects the hair fibres. • Avocado Oil – Vitamins A, V, D & E, protein, amino acids, iron, copper, magnesium and folic acid. It’s good for moisturising dry, brittle and damaged hair. The shampoo doesn't strip the hair and the conditioner provides some good slip, once it's rinsed out it's got nice hydration and a little spring to the curls. Nothing feels dry or lacking of life! 𝗚𝗜𝗩𝗘𝗔𝗪𝗔𝗬 🖤 I've teamed up with @sogooditsnoughty to celebrate the range launching on @feelunique to give one lucky person their "Wave Hello" range; which consists of shampoo, conditioner and taming cream. My curlfriends, you'll love them! View the range: https://bit.ly/2NywjHg Noughty Haircare is 97% natural, vegan, cruelty-free & contains no nasties such as sulphates, parabens and silicones. They smell amazing while being effective products. How can you say no? 𝗛𝗢𝗪 𝗧𝗢 𝗘𝗡𝗧𝗘𝗥 _Follow @sogooditsnoughty & @feelunique right here on IG. _Like this post & tag your bestie in the comments below. _Winner will be chosen at random from eligible entrants. _Giveaway is live from Tues 18th September - Tues 25th September. Competition live from Tuesday 18th September until September 25th September. Winner to be announced on Wednesday 26th September. Have you heard or used anything from Noughty Haircare before? I love brands that put in a little extra in their products and business, not tried this brand before but sounds lovely. I haven't heard of this brand myself. I love that they contain natural ingredients. Ooh I've never heard of this brand before. I would love to try them!